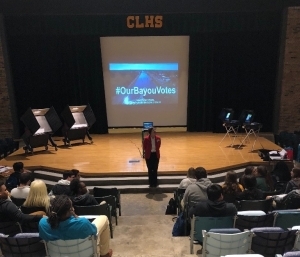 THIBODAUX, LA – On Thursday, October 3, 2018, Annette Fontana, Lafourche Parish Clerk of Court and Chief Election Official for Lafourche Parish, presented #OurBayouVotes, a voting program, to seniors at Central Lafourche High School. The presentation highlighted the history of the youth vote, current political leaders and the upcoming elections. The program included several interactive activities that allowed students to understand the impact of youth voter decline in America. Students also had the opportunity to register to vote and step into a working voting machine to cast a ballot. Fontana said “Our goal is to emphasize the importance of the youth voter voice in America and the right to vote, and to ultimately increase voter turnout. The program is designed to help students register to vote and give them a certain level of comfort their first time stepping up to a voting machine on Election Day.” The program is dedicated to reaching out to high school students and encouraging them to start the path toward lifelong civic participation. The Registrar of Voters Office and the Secretary of State partner in this program.